This salad is a great nutritious indulgence this time of year. Let’s face it, Brussels sprouts are not high on the veggie love list – they get made fun of and are definitely misunderstood. Those of you who love them as much as I do know well they do not have to be the boiled, bland version you might have been served as a child forced to shove down. They can be incredibly delicious and their nutritional benefits are mind blowing! Roasting Brussels sprouts with olive oil, salt and pepper results in a caramelized goodness that brings out their nutty woody flavor. 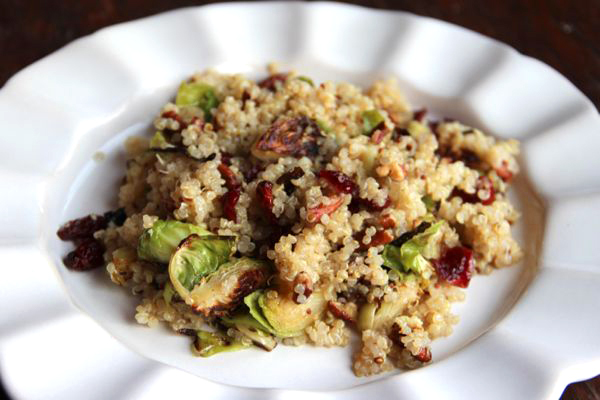 Add in quinoa and some tasty accompaniments like cranberries and walnuts, dress with a Maple vinaigrette and voila … a side dish or salad I have no doubt you will enjoy!